Saturday, January 27: Today's birding trip was full of surprises. 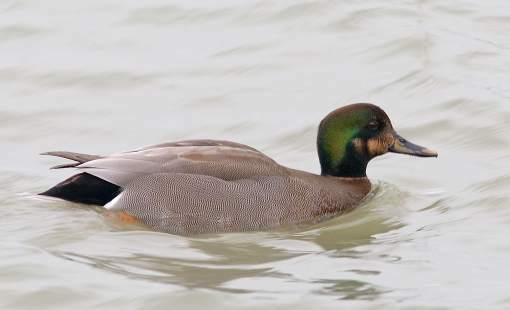 A male Brewer's Duck (hybrid MallardXGadwall) was found at Lakeview Marina in Windsor. The bird was with a large flock of Mallards at the mouth of Little River. The marina affords a good view of Peche Island where large numbers of waterfowl were present. Highlights included 27 Great Blue Herons, 4 Ruddy Ducks, 2 White-winged Scoters and 6 Hooded Mergansers. The most common species along the river were Canvasback, Mallard, Common Merganser and Common Goldeneye. There were small pockets of open water at the mouth of the Thames River at Lighthouse Cove. In addition to hundreds of waterfowl concentrated here there were another 28 Great Blue Herons, 8 Double- crested Cormorants, 3 Pied-billed Grebes, 3 Bald Eagles, 1 adult Glaucous Gull and 1 first winter Lesser Black-backed Gull. In the open fields along the road into Lighthouse Cove there was a nice mixed flock of Lapland Longspurs (+12), Snow Buntings and Horned Larks (the yellow Northern race). Also reported today was a Yellow-rumped Warbler next to Kennedy High School by Ian Woodfield. This is possibly the same bird that visited Ian's feeder on January 13 and 19. Thursday, January 25: The mild spell ended on January 12 and the pond was frozen by January 16. There is still some open water along Turkey Creek where a Great Blue Heron was seen January 24 and a Belted Kingfisher January 25. Tom Preney flushed an American Woodcock from a ditch in the nature reserve on the 23rd. Wednesday, January 10: Here is a photo of Comet McNaught taken just after sunset from the top of the hill at Malden Park. 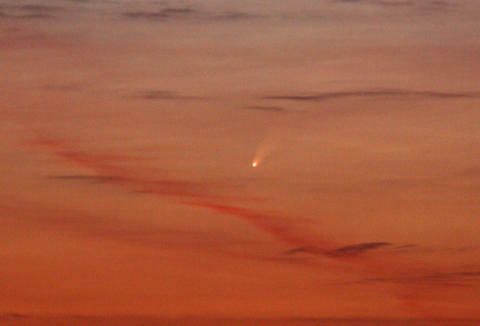 This was one of the brightest comets to be seen in the past 75 years. Wednesday, January 03: Exceptionally mild weather continues in the region. 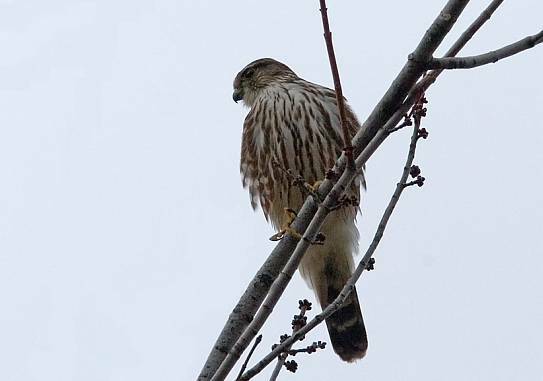 The Detroit River Christmas Bird Count was held on January 1. Highlights from this count included a Common Yellowthroat found at the mouth of Turkey Creek, a Northern Shrike at Malden Park and Wild Turkey at the Ojibway Prairie. Other totals included 23 Carolina Wrens, 48 Robins and 8 Eastern Bluebirds. The complete results are avilable from the CBC page.